Talking about cherry picking, let’s check at the The Young Turks‘ argument to support stricter gun control in the USA: “ban guns like Japan and you have 2 gun related homicides, don’t ban guns and you have 10,225 gun related homicides”. And they explain their point in a way that you’d better not to dare to disagree. Sure they could have compared data from 2007 where the USA had 9,146 gun related homicides and Brazil 34,678 mentioning that Brazil has much tighter gun control laws than the USA but, unfortunately, this is the way politics and media works; it does not matter if you are right or wrong, only if you look right or wrong. But let’s analyze some data and a few more examples of how information is presented to us. One might expect that the number of guns in a country would affect the way people do their killing by favoring guns, but if this was so we should see an ascending trend in this plot yet such trend is nowhere to be seen. The United States, despite being the country with the highest number of guns per person by far, it is placed just a bit above average in the percent of homicides, in other words, there is no nothing in this plot hinting that availability of guns makes them the tool of choice to commit murder. One possible reason might be the fact that murderers don’t want to get caught and guns are way too conspicuous. 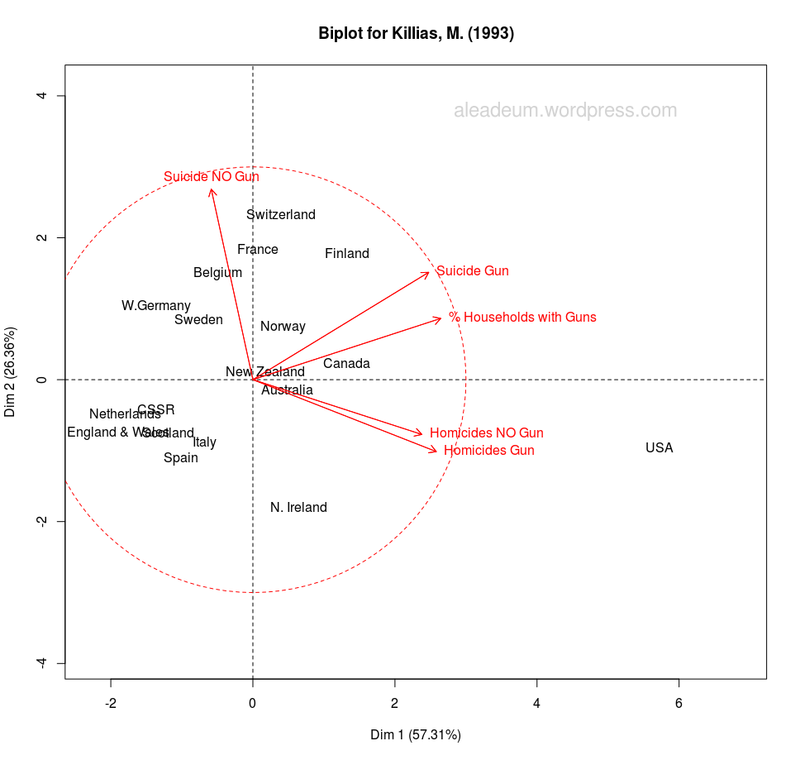 This plot is even more interesting than the previous one; not only it does not show an ascending trend for the number of homicides, but there are no countries with high availability and high homicide rates, we could argue that having an average of 17 firearms or higher per 100 people nearly guarantees homicides rates lower than 3-4 per 100K people! In other words, surprisingly this plot suggests that worldwide high availability of firearms might prevent high rates of homicides by firearms. 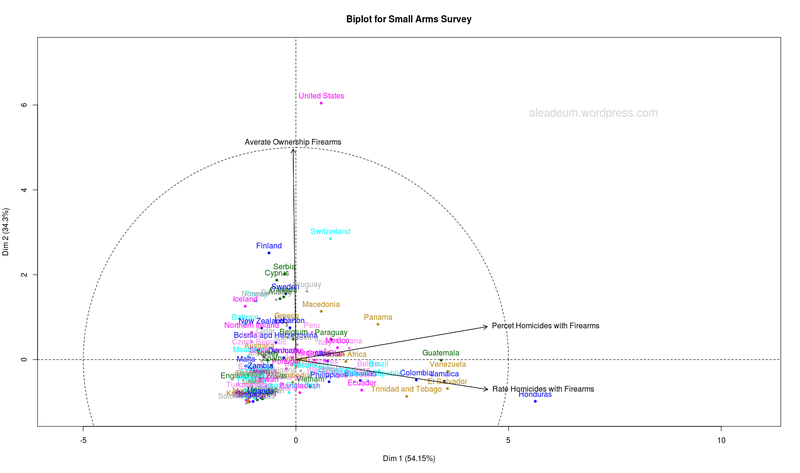 This biplot explains with just two dimensions the 88.6% of the data variability, in it we can appreciate that the availability of firearms among the population has little to do with the percentage and rate of homicides with firearms but, interestingly, though more availability of firearms shows a small positive correlation with the percentage of homicides with firearms, it also shows a small negative correlation with the rate of homicides with firearms. In short, and based on this data, there is no reason to believe that by just reducing the availability of firearms we will decrease the the rate or the percentage of firearms homicides noticeably. So, are my favorite TV hosts lying when they say that there are studies showing that guns increase suicide rates, increase murder rates and that, basically, they are the root of all kind of evil in society? No, they are not lying, but many of these studies do as The Young Turks did, they select a few countries that confirm their beliefs and ignore the rest. This selection does not have to be a conspiracy with political content; we can only work with the data we have available but if the data is limited so should be the conclusions. The two dimensions in this biplot explains 83.67% of the variability of the data for the five variables of the study. In this case we don’t have a rate of firearms but a percentage of households with guns to establish the availability of firearms in the population. We can see in the plot no relationship whatsoever between the percentage of households with guns and the suicide rate with no guns, on the other hand there is a strong relationship between that percentage and the number of suicides with guns. One might argue that these suicides would not happen if those households would not have guns, but one might also argue that those suicides would have taken place anyway by other means. This data by itself does not show what would happen to the overall rate of suicides if no gun was available. There are other parameters to consider though, even if the rate of suicides does not change after banning guns, it could be due to that those committing suicide would take a much longer time to do so if they don’t have a gun. Nonetheless, we can find countries where guns are completely banned like Japan and yet they have much higher rate of suicides than countries with high availability of guns like the USA, which means that suicide is a problem more complex than just having guns available. 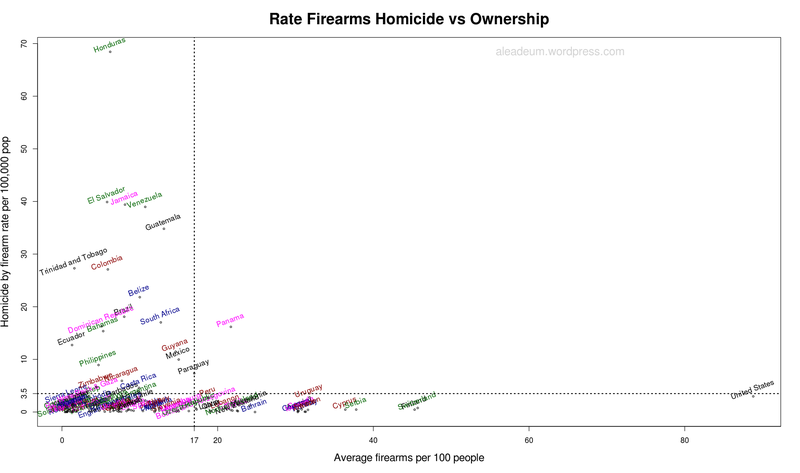 An interesting correlation to explore would be the negative one between the rate of homicides and the suicides with no guns. Though this correlation is not big it would be interesting to investigate what social phenomena is behind this effect; is it possible that to some extend when nobody wants to kill us we realize we want to die anyway? It remains to be seen however, whether these obligations will be confirmed when the analysis is extended, as in the present study, to a larger sample of countries. 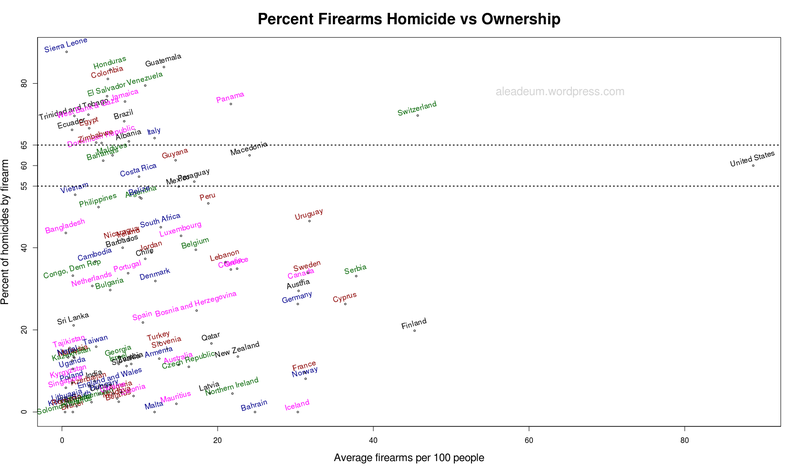 And when we previously analyzed data for 178 countries we found no correlation between availability of guns and gun homicide and, even if there truly is a correlation, we still have to determine if those households acquired guns to protect themselves from the gun homicides or the households having guns are the cause for these homicides; cause and effect cannot be established by data alone, we need a thoughtful set of sociological models among which data might support one over the others. There are many issues to be considered when it comes to gun control, but the oversimplified statements that media offer only help to perpetuate a situation where truth is second place after feelings and political bias. Thanks for the run-down, Francisco! I wish more people would get better statistics before trying to use numbers to prove their point. You’re welcome Daniel! Yeah you’re right, it is sad that we cannot trust a single piece of statistics coming from most media. Oh yeah, data dredging or cherry picking on existing data is a real danger and whenever possible analyzing new data that is the way to go. Yet, very often obtaining new data for our studies is not possible, e.g. we cannot create new universes to see if stars would spread differently. Astronomy is entirely based on “data-out-there”. We cannot either go back in time to see how much impact environmental policies would have in climate temperatures, and the same goes to any time related data in any field of science. Sometimes obtaining data is possible but way too expensive or simply downright unmoral; like finding out how long it takes for a man to die naked in temperatures below zero. There are many scenarios in which the only real option is data-out-there and we do the best we can with it. So in short; sometimes we can cast shadows with our torches, and sometimes our only option is to wait and see what shadows are casted when the Sun raises. if cherry picking, distortion selection, give some understanding, as they have historically done in the sciences, then by all means. Nonetheless, letting these things go unpunished just because eventually they are right might drive the rest of the scientific community to do the same; hiding data based on hunches or publishing half cooked papers to be the first “proving” a theory and let other researchers do the dirty job of professionally proving their hunches.